Why all the modern Storage QoS Implementations are not good enough? Storage QoS is starting to become a key functionality today. It is mainly driven by a drive towards increased resource utilization and therefore resource sharing. In the past, Storage would have dedicated RAID group for LUNs and the applications would have LUNs dedicated to it. This worked really well in terms of guaranteed IOPs and Isolation. As disk sizes increased and storage technology matured, we started sharing the drives amongst the LUNs and these LUNs were no longer Isolated from each other. Virtualization made the situation even worse because not only the disks got shared amongst LUNs, the LUNs themselves got shared by multiple workloads (VMs). This resulted in Noisy Neighbor problems that impacted these LUNs and Volumes based storage systems. A few Storage Vendors have some form of manual QoS functionality built-in the storage OS. Tintri for example, from the beginning, built an architecture that enabled an Always ON, fully automatic, dynamic QoS at an individual vDisk level (think VMDKs, VHDs etc.) that ensured automatic storage resource reservation at the vDisk level (based on our built-in IO analytics engine) so that every vDisk gets the performance it needs at sub-ms response time. The architecture is designed such that a new vDisk gets its performance from free reserves available in the system. So, at no point another vDisk that needs more performance impacts an existing vDisk. The approach is different from traditional approach where one manually sets up QoS at a LUN/Volume level but is highly effective for IT organizations that don’t want to hand hold the storage system. Tintri is the only storage product out there that has an Always ON, dynamic QoS enabled within all its storage appliances. In today’s datacenters, workloads are Virtual and Clouds are not implemented without Virtualization. In these Virtualization enabled datacenters, dealing with LUNs/Volumes is a pain. LUNs were brought into the industry 30-40 years back, when the workloads were physical and we started using these LUNs/Volumes even with Virtualized workloads because thats what the storage systems knew. 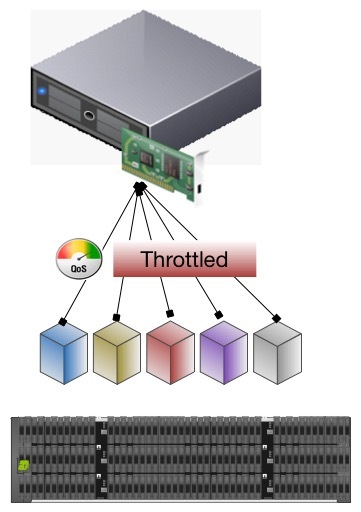 In a virtual environment, a LUN has multiple workloads running in it. Implementing QoS on LUNs has no advantage for virtual workloads whether it is being implemented for isolation or chargeback. VVols would change it (only for vSphere) but there is still a long way to go there as VVols don’t support all the vSphere features and not all vendors have a practically deployable implementation. The result is that VMs in a LUN/Volume end up sharing the IOPs limits set up at the LUN/Volume level and therefore end up interfering with each other. Storage QoS is implemented by IOPs. One can combine it with MB/s but only a few vendors allow you to do that. Usually, it is just one or the other. The same 1000 IOPs can mean 16x more load on a system when looking at 64K block size Vs 4K. That is a lot of difference for a Service Provider to take into account when deciding the pricing for a service. In some cases even large number of small block size IOs may impact storage more than large block IOs. Now some vendors can combine the IOPs limit with throughput to get around this to some extent but ideally service providers want one unit to bill against and want a single scale to measure everyone. Microsoft’s implementation of Normalized IOPs is a great example of such a metric. Some Storage systems using QoS on LUNs have this problem to deal with specifically when it comes to hosts that have more than one LUN coming from a storage system mapped through a HBA. When one implements QoS limits on a specific LUN and that LUN tries to go above that limit, it gets throttled by the storage system. The IOs get queued up at the HBA level and at that point the host starts to throttle the IO to the LUN and it does that for not just the LUN in question but to all the LUNs coming from that storage, thinking that storage system is not able to take the load that it is trying to send. This makes it practically impossible to implement QoS at an individual LUN level without impacting other LUNs. Most of the storage vendors have QoS more as a check box with a very few real world deployments. The reason is that QoS is really complex to implement and there are more chances of getting it wrong than right. QoS has to be implemented like a strategy and across all workloads. The challenge is that once someone gets it wrong it is not easy to fix and requires involving Vendor Support teams to determine the cause. Some vendors sell Professional Services around this, which makes it a really expensive feature to implement. The other point being that QoS itself can become the cause of latency either because of the Max Limits setup on a workload or because of the contention resulting from the cumulative Minimum guaranteed IOPs set up on various workloads exceeding the overall performance capability of the storage system. Ideally the storage systems should give more insight into QoS and its impact on various workloads so that if someone complains of latency or drop in performance, the IT team is quickly able to pin point the reason. None of the storage vendors provide advanced user friendly analytics for QoS today and that is one of the biggest inhibitors in terms of real world adoption of QoS. To summarize, QoS offered by storage vendors today is not granular enough, it doesn’t have a single scale to measure or apply QoS guarantees/ limits, it doesn’t ensure performance fair-share, it doesn’t guarantee isolation and storage providers don’t have the necessary analytics associated with it to make it easy to implement and then troubleshoot QoS related issues. I think its time to address these challenges so that QoS can be widely accepted and implemented in the datacenter. This entry was posted in Cloud, Converged Infrastructures, General, Tintri, VMware and tagged guarantee, performance, QoS, Storage, Virtual Infrastructure, VM, vvol by Satinder Sharma. Bookmark the permalink.